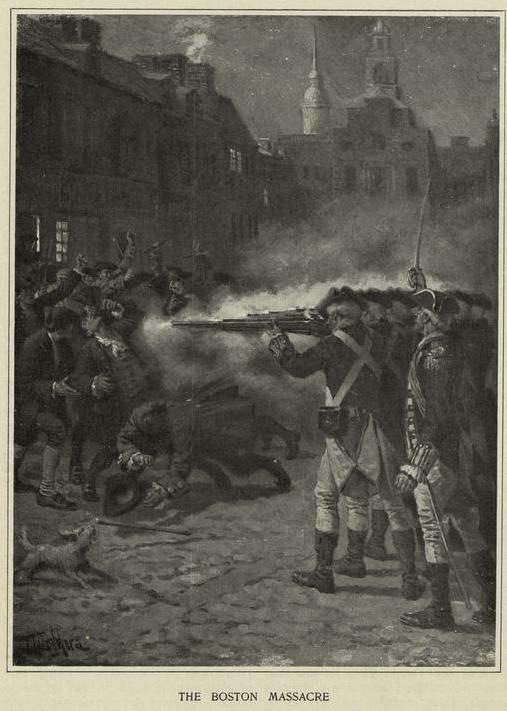 Today, or rather tonight, marks the anniversary of the Boston Massacre of 1770, the most dramatic manifestation of the rising tensions in Boston accompanying the occupation of the city by British troops sent from London to enforce the Townshend Acts and make the colonists pay for their Seven Years’/French and Indian War. Well, there you are: the conflicted sentiments of an English historian who is also a native New Englander are readily apparent! 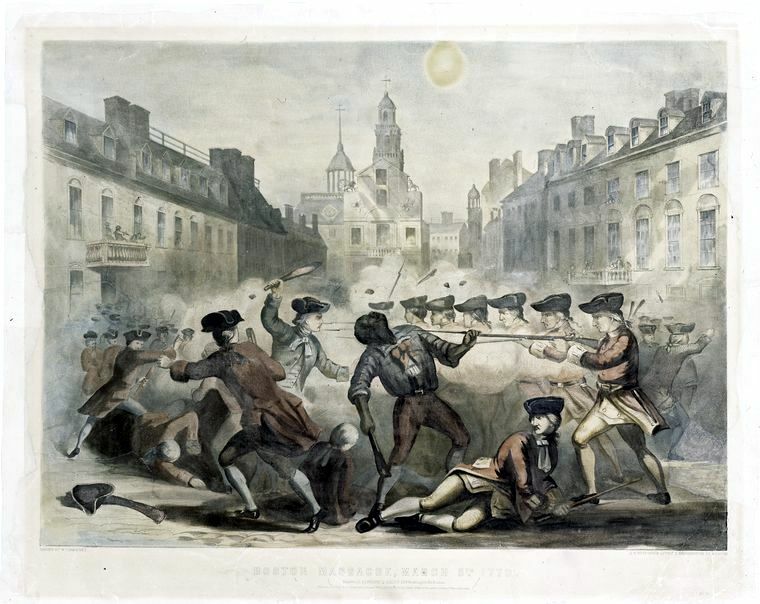 What became known as the Boston Massacre affords an excellent opportunity to examine the shadings of perspective in history, and we have the perfect image to work with: Paul Revere’s iconic Bloody Massacre perpetuated in King Street Boston on March 5th 1770 by a Party of the 29th Regt., published less than three weeks after the event. Revere was such a clever entrepreneur and propagandist; it’s too bad his midnight ride obscures his other talents and contributions. 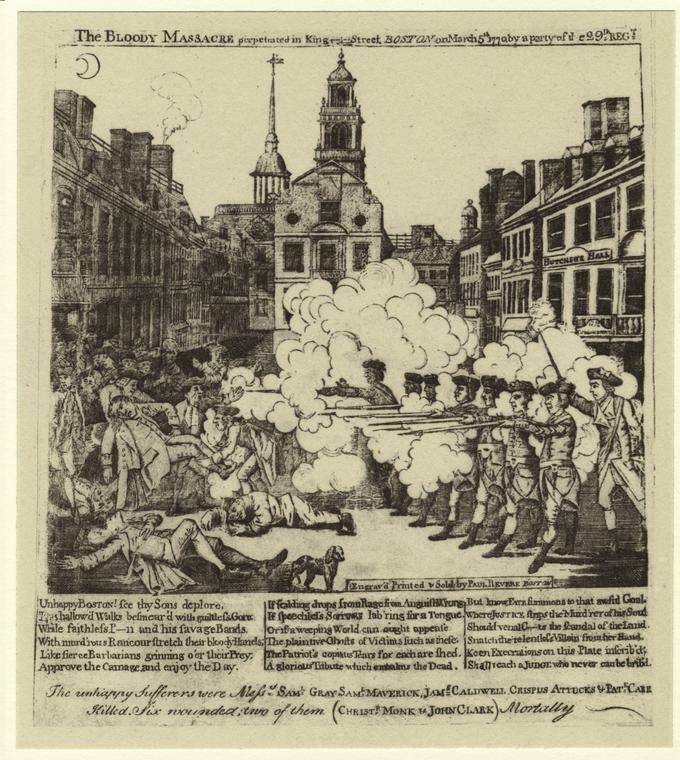 The engraving that produced these viral prints was very closely based on that of Henry Pelham, whose own massacre image “The Fruits of Arbitrary Power”, did not go on the market until several weeks after Revere had essentially flooded the market and sparked a revolution. 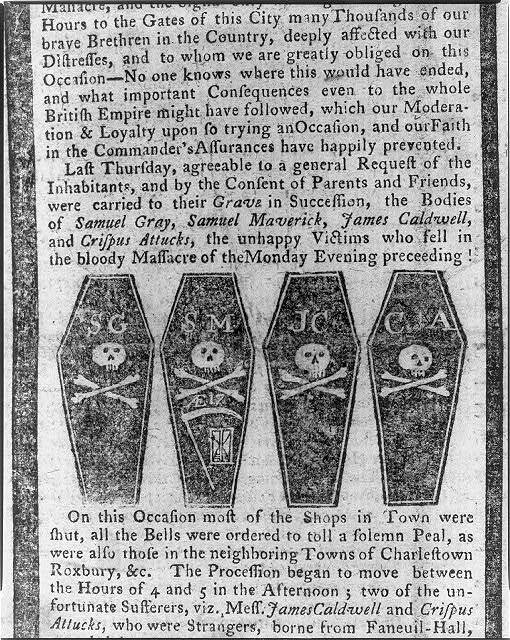 The most “inspirational” detail of the print, in terms of igniting revolutionary fervor up and down the eastern seaboard, was no doubt the portrayal of the British troops in a firing squad format, shooting on the unarmed, passive, victimized colonists, but one other detail, or missing detail, is equally important: all of the victims of Revere’s massacre are white; the fledgling revolution’s first victim, a man of mixed race named Crispus Attucks, is not present. The colorists of Revere’s engraving added to its appeal (and inspiration) by adding a lot of bright red blood to the print, illustrating and emphasizing his original title: Bloody Massacre. 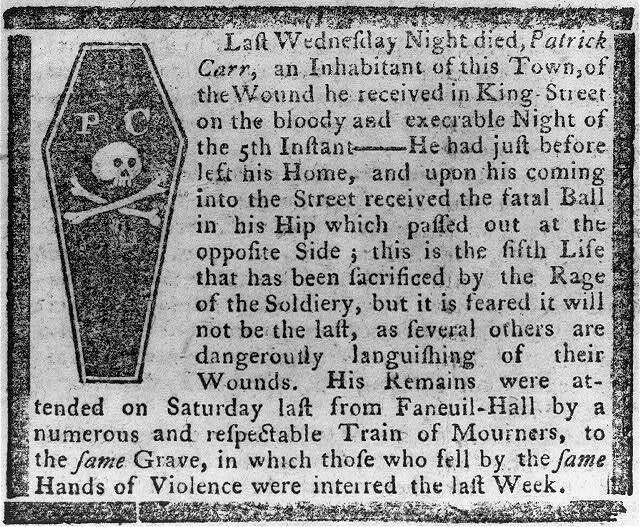 A print from a little later in 1770, and accounts of the five victims of March 5 from the Boston Gazette, and Country Journal, March 12, 1770, all from the Library of Congress. 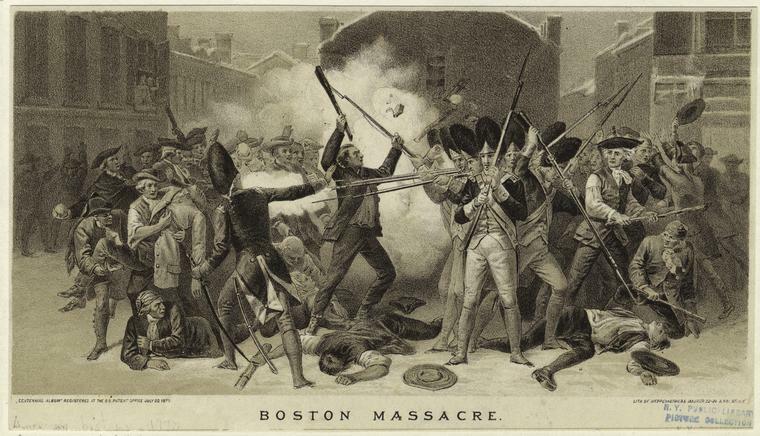 Only a year later, when the first event of the massacre was commemorated, it was already being referred to as the Boston Massacre, largely due to the efforts of another brilliant propagandist, Samuel Adams. All narrative (as opposed to visual) accounts depict more of a confused melee, in which British soldiers fired into a threatening crowd under cover of darkness. But that was beside the point for the entire nineteenth century–and well after. 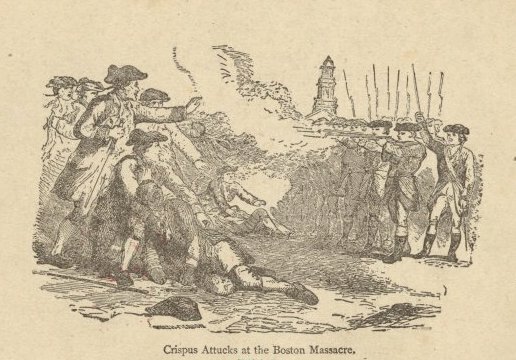 The active abolitionist movement in New England will resurrect Crispus Attucks as an active participant, victim, and martyr of the Boston Massacre in the 1850s,but the Redcoats retain a relatively rigid line. Putting Crispus Attucks in the picture: the frontspiece of William Cooper Nell’s Colored Patriots of the American Revolution (1855), chromolithograph by John H. Bufford based on a drawing by William L. Champney (1856), and Howard Pyle’s illustration for Harper’s Magazine (1883). Despite Attucks’ prominent placement in the prints above, he goes missing again in several popular prints from the later nineteenth and earlier twentieth centuries. The Alonzo Chappel image below, produced for Heppenheimer and Maurer’s popular Centennial Album in 1873, appears to be loosely based on the Bufford chromolithograph above, but a white man has replaced Attucks in the central position. 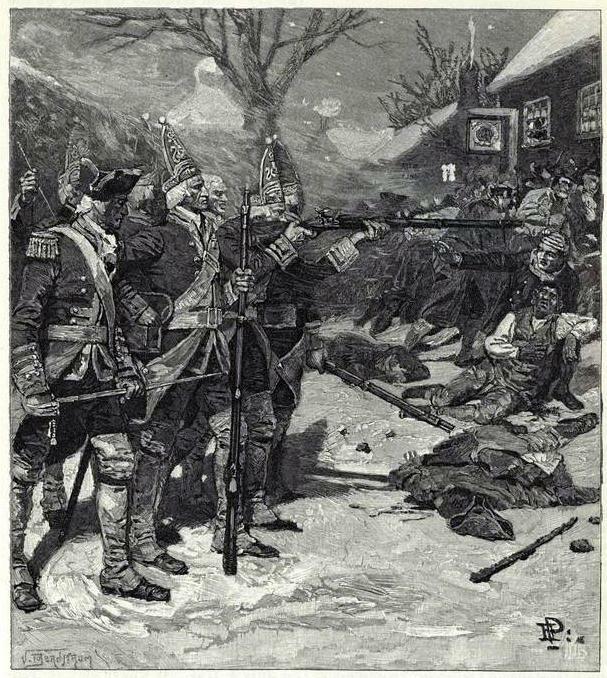 The 1901 image by Francis Luis Mora beneath it, published in Harper’s Magazine, retains Revere’s menacing Redcoats (made more menacing by the perspective) and even the dog which he placed in the middle of the event. Prints by Chappel and Mora, New York Public Library Digital Gallery. 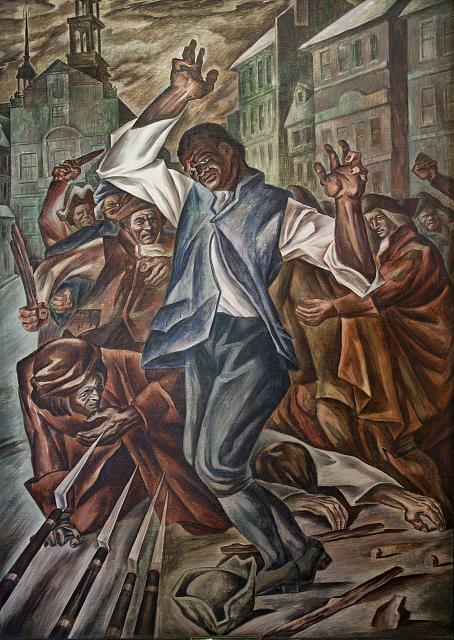 A half-century later, Crispus Attucks returns in two modern depictions of the Massacre: a mural at the Recorder of Deeds Building in Washington, DC by Herschel Levit, and William H. Johnson’s Crispus Attucks. The events of March 5, 1770 fade into the background, or are substantively altered, as Attucks assumes center stage. 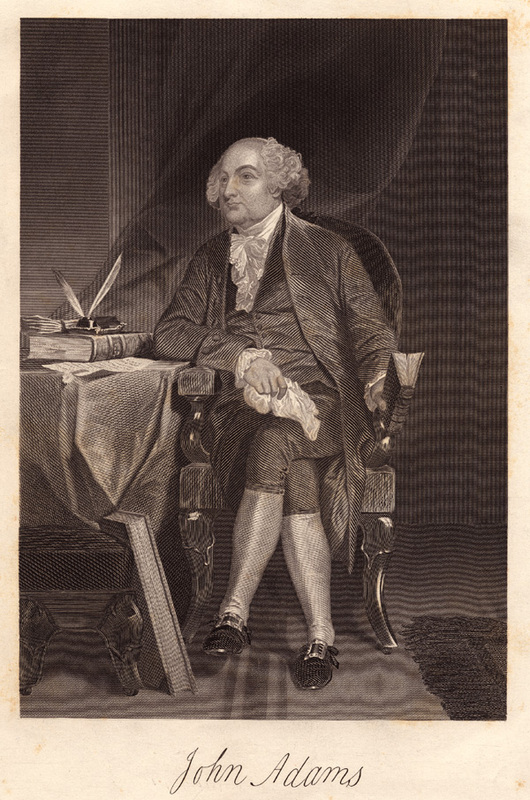 Another figure who is associated with the Boston Massacre, John Adams, has become the central focus of the event in recent years, following the publication of David McCullough’s popular and Pulitzer Prize-winning John Adams in 2001 and the ensuing HBO miniseries based on the book. As Adams served as defense counsel for the accused British soldiers, this seems to have shifted the historical perspective a bit, from event to aftermath, while at the same time revealing a little bit of British sentiment. Herschel Levit, Crispus Attucks (1943) and Philip H. Johnson, Crispus Attucks (1945), Smithsonian Archives of American Art; Alonzo Chappel, John Adams, Library of Congress. This entry was posted on Monday, March 5th, 2012 at 9:31 am	and tagged with Art, Massachusetts, print culture and posted in History. You can follow any responses to this entry through the RSS 2.0 feed. 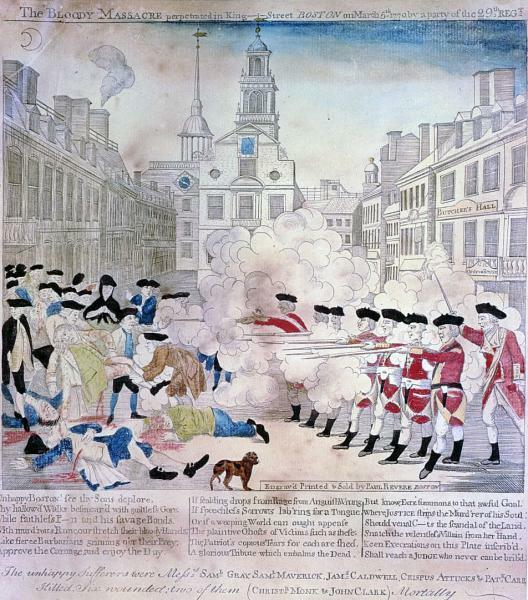 I remember as a child glimpsing Revere’s depiction of the Boston massacre and the two things that always caught my attention was the bright red color of the blood (the propagandists knew their business) and the dog standing stark still despite the melee. As a typical child, question No. 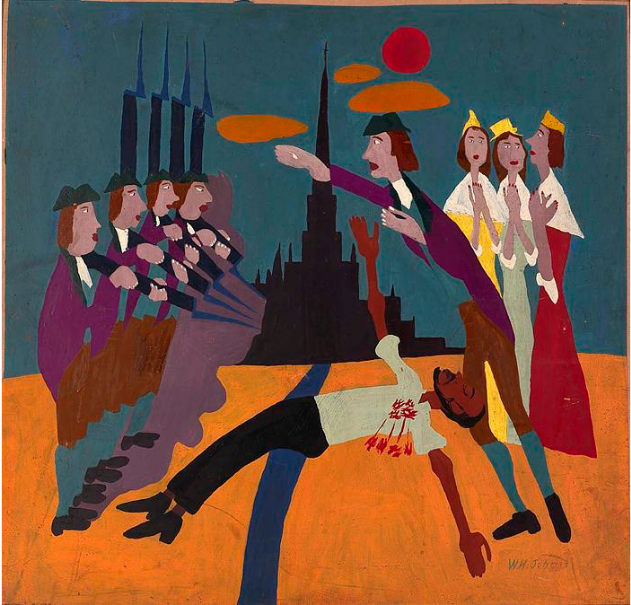 1 was “Why would a dog simply be standing there when guns were firing, people shouting and dying, the whole scene was one of commotion.” Of course, as a kid, I believed that this was a literal representation of what happened. 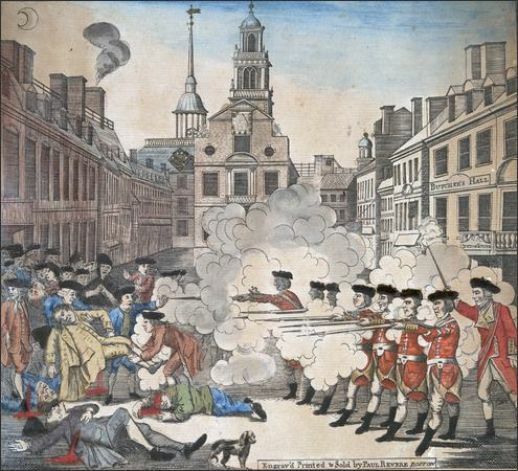 It’s only been recently that I’ve pondered the fact that it more than five full years between the Boston Massacre and official beginning of the American Revolution at Lexington and Concord. I suppose without television, social media and other new-age technology, it was much harder to whip people up into an immediate frenzy. Excellent post, with great images.